Info for talk pages: There are two types of talk pages - the first one is standard talk pages which are used to discuss an article, while user talk pages are used to communicate with other users or leave them messages. Every page has an associated talk page, except pages in the Special: namespace. If there is no discussion of a page, the link to its talk page will be red. You can still discuss the page - you will just be the first person to do so. A talk page adds Talk: to the beginning of the main page's title. If the main page has a prefix then talk is added after this prefix. For example, a talk page associated with the main article namespace simply has the prefix Talk:, while a talk page associated with the user namespace has the prefix User talk:. This article is in the Wikiksimpsons: namespace, so the talk page for this article is Wikisimpsons talk:Talk pages. The Main Page is in the main namespace (because it has no prefix), so its talk page is simply Talk:Main Page. Use indenting to format your discussion. Standard practice is to indent your reply one level deeper than the comment you are replying to. Experiment by editing the talk page of the sandbox. (~~~~ = User 19:54, 25 April 2019 (EDT)). The practice of "spamming" - posting similar messages to more than a few users' talk pages, often for the purpose of soliciting a certain action - is discouraged. Because the wiki software platform provides for a wide range of formatting styles, proper or at least consistent formatting is essential to maintaining readable talk pages. The depth of a message is determined by the number of colons (':') in front of the message. Each colon represents a tab, and are commonly used in discussions on user and article talk pages. If a reply is made to a statement, one adds a colon to the number of colons used in the statement being replied to. This style of conversation is easier to read. Even though a user talk page has your name on it, it is not yours. It is a way of contacting you. You can make it look fancy but you can not make it into a second user page. You can not even remove comments from here as it is not yours but a way of contacting you. The archive comments are also a good way for admins to decide whether a bad user should be blocked if the user has been warned multiple times and removing the comments may make it harder to decide. Those leaving comments on talk pages just saying stuff like "Hi, I'm new" etc. will be warned for spam. These are useless comments that are not acceptable or wanted here. Comments on an article's talk page MUST be related to improving the article. Comments MUST NOT be removed from any page, even if you left it there. If you want a comment you wrote removed, use the strike through command <s></s> to put a line through it. If the comment was vandalism or spam, it can be removed and/or the talk page deleted. Swearing is ALLOWED in talk pages in small doses. If you are constantly swearing, you will received a warning and maybe a block. No personal attacks. This means no insulting users if you know they will act badly towards it. You MUST NOT edit another user's comment, not even to change spelling. The user can change spelling of it if they feel the need. 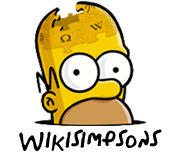 All unsigned comments MUST have either the unsigned user template or unsigned IP template placed after it with the user or IP and the time and date (Wikisimpsons time). Talking about anything not related to the wiki must be taken to IRC. All rules for a normal talk page apply for user talk pages. Even though it is your talk page and has your name in the title, it is not yours to go removing comments from or adding personal info to. You have a user page for that. You are, however, allowed to customize the page if you wish to give it a more personal feel. If someone left you a message on your talk page, you reply on your talk page, not the talk page of the user who left it. Conversations should be kept in one place. The Vandalism Warning and Blocked User Notice ARE NOT to be removed at all. If this happens, you will be warned about removing these. The templates can help admins to know if you are a serial offender or not. If you fail to comply with any of these rules, you will receive a warning. Receiving a second warning will result in a short block. Modified on September 30, 2013, at 10:25.